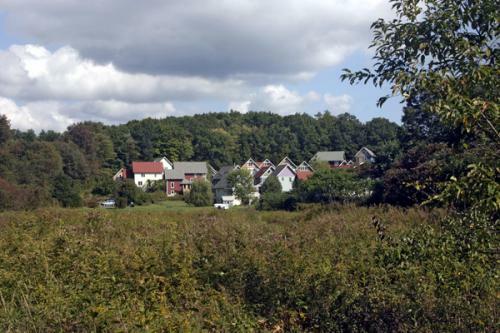 The Pioneer Valley Cohousing set out to create a living environment that encourages a strong sense of community, supports our need for privacy, makes life affordable, and provides a secure and enriched setting for children and adults. We have a place where people know their neighbors in a meaningful way, a neighborhood where different traditions and values are respected, and where we can all have a sense of security and belonging. Even after so many years together, we are still a work in progress, continuing to get better and better at living our values and goals. Our group purchased a 23-acre meadow site in north Amherst where we built 32 units and a large common house, moving in June - September 1994. We built a clustered mix of single, duplex, and triplex buildings on seven of those acres. The rest is field and woods, surrounded by town lands. Residents own their own homes, as well as a share of the land and the common house. The common house is a place for community dinners, meetings, entertainment, and other public and private functions. It includes a large kitchen/dining room, children's playroom, guest rooms, laundry facilities, library, sauna, exercise room, and recycling center. We have optional (but well-attended) dinners two nights a week, gardens, play and work spaces, hiking trails, and other shared amenities chosen by residents have social and economic advantages. The community is a short walk from a municipal lake; a recreation park with tennis, swimming, and playing fields; a small shopping center; a library; the university; and public transportation.